Untie The Ribbons: Gardening Isn't For Sissies! It's Almost Here and I Don't Mean Spring! 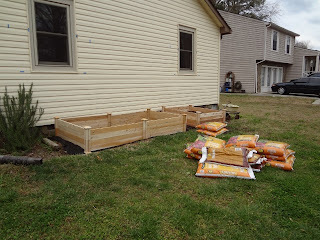 Last year we made our own raised bed planters out of (dare I say cheap) fiberboard built around pallets that I knew wouldn't hold up too long. 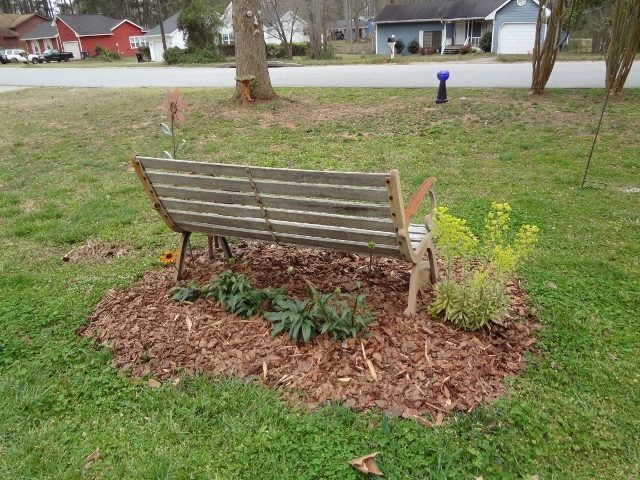 As of this spring they were totally rotted and it was time for something that would last longer. 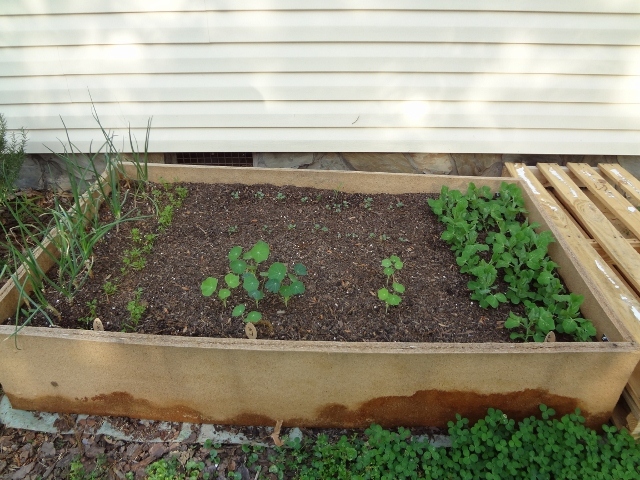 So we found some food grade non-rotting (supposedly) cedar put-it-together-yourself-easily raised bed kits at Home Depot and decided that we wanted them a little deeper than the seven inches tall that they were. These you could stack one on another and put them into many configurations. So we now have one four by eight and one four by four that are fourteen inches tall. I'm sure the neighbors are very relieved! Now I will say it wasn't rocket science putting the kits together and you didn't need any tools except maybe a rubber mallet and then a screwdriver for the caps. So that was a plus. But the bending over putting them together for several hours when your back isn't wonderful in the first place was the minus. And the shoveling - oh the shoveling. First shovel the dirt from one of the old planting beds into the other old planting bed, tear the first planting bed apart. Put together two of the kits making the four by four. And then shovel ALL of the dirt from the other old planting bed into the new one. Add one bag of potting mix and one half bag of mushroom compost. And rake it all smooth. 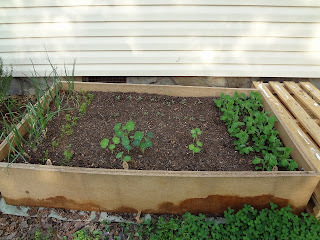 After all, last year with all of the dirt and amendments we put into the original beds - we couldn't waste a morsel of dirt - too expensive and too much good dirt LOL Then tear down the second old planting bed, put three more kits together making the four by eight. And then dump thirteen bags of potting mix and three and a half bags of mushroom compost into it and rake that smooth. I think about six more bags of potting mix ought to do it. By now you're probably saying - and what is wrong with the dirt in the ground where you live (and where the heck are your shutters)? Well, we have solid rock-hard red Georgia clay - need I say more? And the shutters are in the process of being painted a new color - will post those when they go back up. To be perfectly honest here...Mr. Whimsey tore the old planting beds apart (he wanted to save the L brackets - can you say thrifty?) 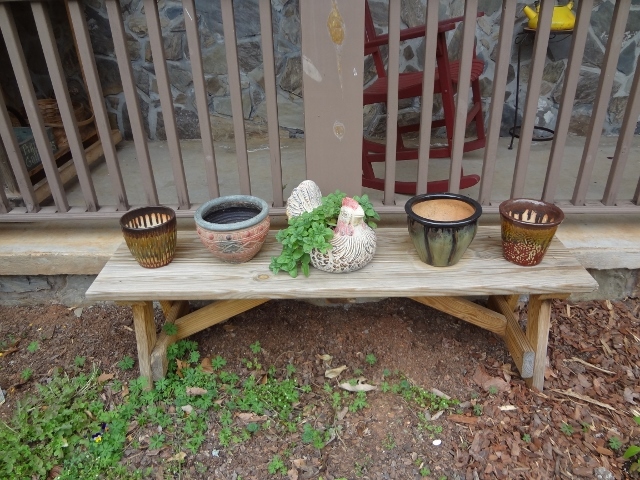 and he picked up most of the bags of potting soil and dumped them into the new bed once I (and my friend Teresa) unloaded them from the truck. Even though my back is screaming "NOOOOOOOOOOOOOO MORE!!! ", I'm still glad it's finally really spring here - or seems to be from the yellow pollen I started seeing on the car today. 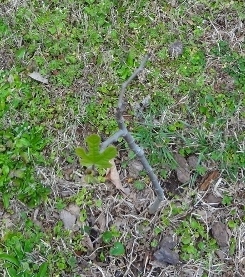 Our tiny little fig tree has three branches and one full leaf as well as some buds. The ornamental peach is bursting into bloom and is full of buds. 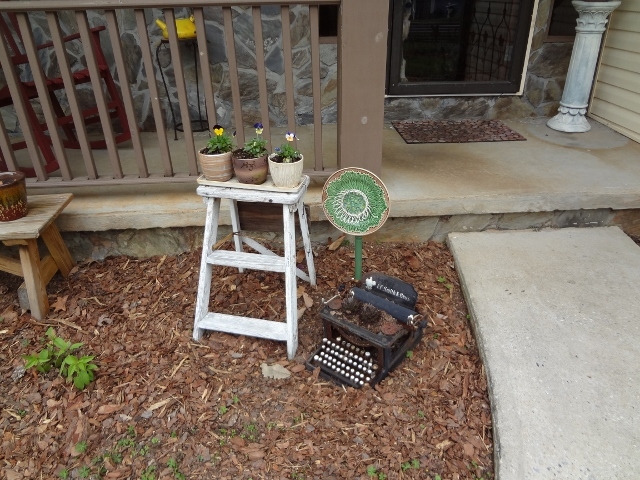 I have pineapple sage and Greek oregano planted in my herb garden, black hens and chicks in my old typewriter, and johnny-jump-ups in an old wood tray and three little pots. The Carolina jessamine is gorgeous and smells wonderful too. 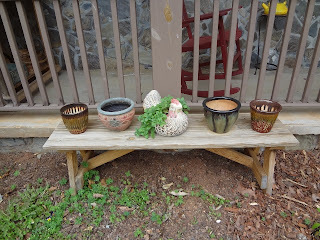 Bright orange cone flowers and lime green Euphorbia are planted by the yard bench. I love Euphorbia - it looks like tiny bells. Thank you God and Mother Earth for your blessings! We have red clay and aching old backs too. Sissies need not apply. Your cedar raised beds should last a good,long while. Weeding?!! 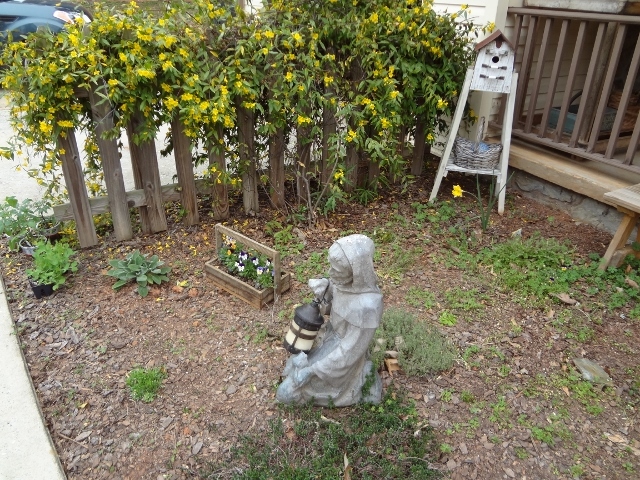 What can I say except that I have begun to accept many "weeds" as charming and old fashioned groundcovers. 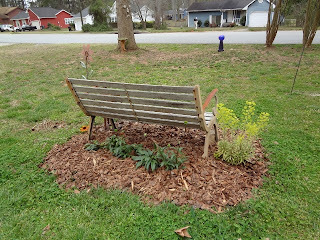 I got tired of being stressed out by weeds in my garden. You go girl!!! I had NO idea that Home Depot carried such kits!! Ha...i am not gonna tell the hubs that after I made him hammer, sweat, and yell and the one we made last year!!! It looks FANTASTIC!!! I'm loving all the greens and blooms I am seeing in your neck of the woods!!! How wonderful! They are calling for snow again here on Tuesday!! Can you say BOO! Keep up the hard work! Can't wait to see more of your garden!!! Gosh that sounds like a lot of work - no wonder your back is aching. I can just see it all filled with wonderful healthy vegetables though and then it will all be worth it. OMG after only reading your story my back is already painful!!!!! God allows us to garden on our knees to keep us humble, Jill. 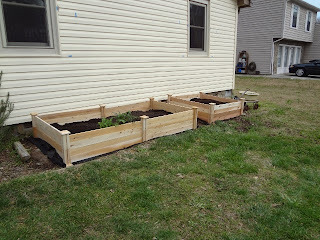 Your gardening project looks grand; so much good food to come. Looking good! Hope this cold weather doesn't do them in.